If you watch enough of the dreck programming on HGTV, you will be left with the idea that there's something inherently wrong with ceiling fans. This is just one more thing to add to an already long list of design crimes committed by that network. Don't believe it. Ceiling fans have a place in a remodel and an important role to play, especially in a climate like Florida's. 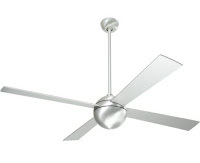 However, the quest for a ceiling fan starts and stops in the lighting aisle at Home Depot for a lot of people. This is as big a mistake as believing something you hear on "Extreme Home Makeover." 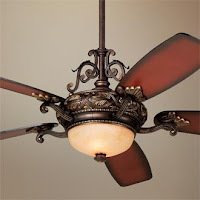 If you're in the market for lighting or a ceiling fan and you're going to buy from a home center, please read up on the good stuff so you can buy a better knock off. Back in the day, ceiling fans were dominated by the brand Casablanca. 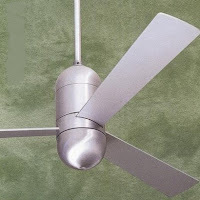 Casablanca is still very much in the business and they set the standard for traditional ceiling fans. All design is derivative and the lighting industry adheres to that maxim with a surprising tenacity. When ceiling fans started to get popular again about 20 to 25 years ago, the industry looked to Casablanca as a resource to imitate. At the time, all of Casablanca's offerings were uber traditional with a distinct Victorian feel. That Victorian feel continues to this day in most of the fans in the $50 to $150 price range in the previously mentioned lighting aisle. These cheap fans are also precisely the fans that deserve to be pulled down and given the heave ho. A ceiling-mounted fan with three or four, hundred-watt light bulbs nestled underneath it is the stuff of a bad dream. 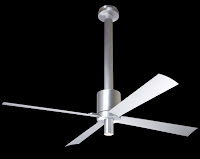 However, regardless of the style of a room; a subtle, unlighted fan can be a welcome addition. In a cathedral ceiling-ed great room, they circulate cool air in the hot months and warm air in the cool months. In a climate like ours, this is a vital task and it will save money on utility bills. 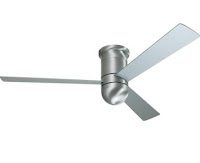 In a smaller room, a ceiling fan will do the same thing but on a smaller scale. Air circulation is their primary function, looking to them as a source of everyday ambient light is best avoided. There are two companies whose offerings I like and specify. Neither of them feature a Victorian line (although one of them does have a traditional line of fans) and they are blazing a path toward a new era in air circulation. The Modern Fan Company and Minka make some pretty cool stuff. Although they are premium brands, their prices fall into a price point I consider to be reasonable for the value their products bring. You will find neither of these brands in a home center and to see them you'll need to go to an independent lighting retailer. Patronizing an independent, local vendor is a better practice for a couple of reasons. They know what they're talking about for starters. Additionally, they offer products the home centers won't touch. And finally, they pay their employees a living wage. Keeping local money local is in the best interest of everybody. If you're local to me, I usually take my clients to Blaylock's Lighting in lovely, lovely Seminole, FL. If you're not local, Form Plus Function is a great website for interesting fans and lighting. So before you listen too closely to Paige Davis and yank out your fans, take a closer look at them and think about whether or not you use them for their intended purpose. If you do use them, by all means keep a fan on the ceiling. Just don't allow it to be an unintentional focal point.